Si vous désirez participer à un atelier d’astronomie organisé par astroGC mais votre niveau d’anglais n’est pas très bon, veuillez visiter ce lien : aide aux francophones. Merci. 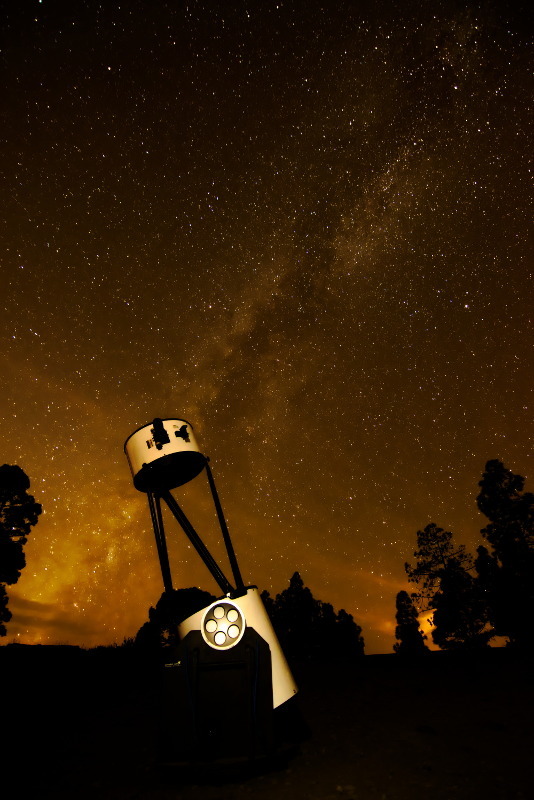 What are the best locations on Gran Canaria for Stargazing? To be able to stargaze in good conditions you want a place with low light pollution and obviously clear sky. If you are going to use a high magnification telescope it is good to be at high altitude. Less air between you and the stars means less air movements and less image distortion. In Gran Canaria, the South-West of the Island is by far the best due to the low light pollution, usually clear sky and high altitude. It is important to get far away from urban areas. The North of the island is affected by lights of Las Palmas, the East is affected by lights of the airport, Telde, Vecindario and Maspalomas. The West and South-West are good as long as you get inland, away from urban and tourist places of the coast. The centre of the island is good as well mainly due to high altitude but it is not as dark as the South-West and is more likely windy. The South-West is also good due to the good weather. The main winds blowing in Gran Canaria are the lower trade winds blowing from the North and North-East. The air charged of humidity hit the relieve on the North and North-East, get higher, and produces clouds. The well known “donkey bell” of Las Palmas area is a sticky and incommodious cloud due to this phenomena. The other side of the island, the South-West, is generally very clear when trade winds are blowing. In the South-West: “Presa de Las Niñas”, “Cruz de San Antonio”, “Presa del Mulato”. Presa de Las Niñas (2): “Presa” means “Dam”. There is a retain of water with some flat areas to park the car and enjoy the night. There is also a free camping area with some barbecue toilets and water but you need an authorization from the local authorities to stay there at night. 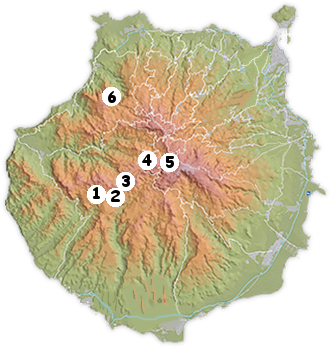 There are a few more dams in this area: Presa del Mulato, Presa de Soria, Presa de Chira. All of this places are very good to stargaze. Roque Nublo (4): the big rock is emblematic of the island. The (current) name literally means “Cloudy rock”. You want this name to be inaccurate for the night you are getting there. There is a parking next to the road. You can just stay there or carefully have a night walk to the huge rock. Remember you are in mountains and there are inherent risks. It can also be really cold during the winter. El Garañón (5) and Tambadaba (6): again there are some barbecue, toilets and water but you need authorization from authorities to stay there for a night. This are wooden areas so you may have some difficulties if it important for you to have an open view in al directions. 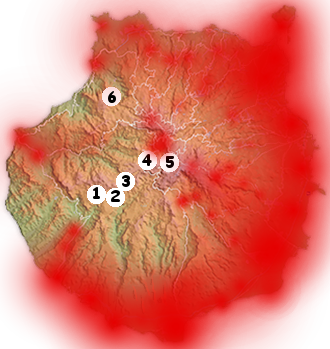 People sometimes ask me what is the temperature like in Gran Canaria mountains at night. But it is not only a question of temperature. I mean cold sensation can be very surprising despite of apparently affordable temperature. In Presa de Las Niñas I have seen Russian people freezing at 12ºC. And the top of the island can be less than 0ºC in winter. For sure it can also be warm, but do not be confident. What constellations are visitors most likely to see between November and February? The constellations you are seeing in the sky depend on the earth position and thus they do not only depend on the earth rotation around the sun (the seasons) but also it's rotation around it's own axis (the time). I mean the constellations you can see depend on the time you are observing the sky. Supposing you are not an ardent fan of stars waiting for 5 am to see an event, I am going to describe here what you can see in the sky from 30 minutes to 2 hours after the sunset. But if you want to see the sky I am describing for February in November, you just have to wait a few hours. In November you can still observe in the West Hercules constellation which contains a nice globular star cluster observable with a telescope. Right upon you are the constellations of Lyra and Cygnus containing also some nice objects. To the East is Andromeda constellation with the well known Andromeda galaxy. If there is no moon in the sky the Andromeda galaxy will be visible with naked eyes. In the ecliptic plane are the zodiacal constellations of Sagittarius, Capricornus, Aquarius, Pisces and Aries. None of them is very easy to recognize for an unaccustomed observer. In December we are losing Hercules constellation which is getting too low to the horizon. Lyra and Cygnus are shifting to the West. Andromeda is getting higher and the galaxy is thus more visible. On the East is rising the Taurus zodiacal constellation which is quite easy to recognize. Taurus constellation contains the Pleiades or 7 sisters. An easy observable star cluster even with naked eyes. In January is rising at the East the Orion constellation. This is one of the most appreciated constellation for stargazers. It is very easy to recognize and even people with no knowledge sometimes remember having seen this pattern of stars in the sky. It contains the Great Orion nebula which can almost be seen with naked eyes, good to be observed with binoculars and fantastic with a wide aperture telescope. In February Orion is rising higher, Pleiades is in the zenith and we can observe at the East the zodiacal constellations of Gemini and Cancer rising up. 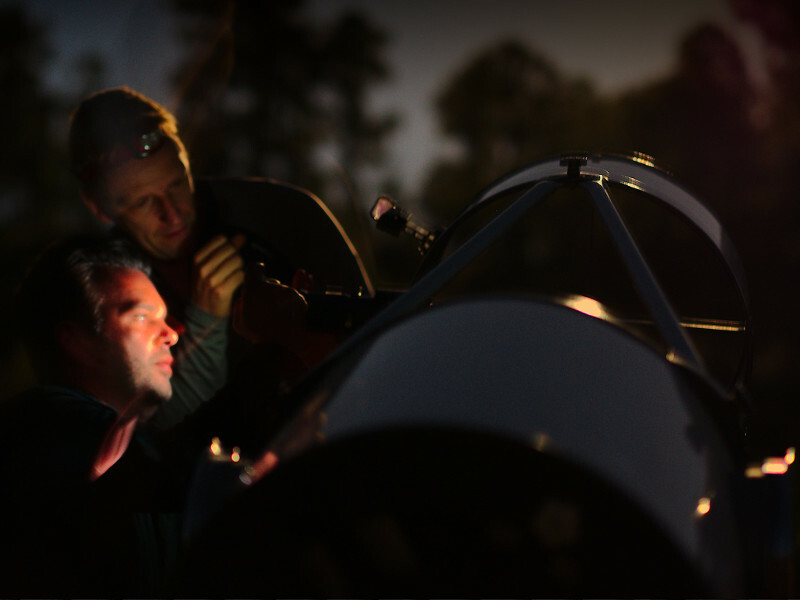 What started your interest in astronomy? My interest in astronomy started during my childhood. I was fascinated with stars and could watch the sky during hours before sleeping with no roof as I was boyscout. Later I studied Mathematics and Physics. It is absolutely fascinating how researchers in the past and nowadays can explain many things we are observing despite of huge distances and difficulties to gather information. Observing the sky is also a huge lesson of humility as you may feel your own insignificance. What made you decide to set up AstroGC? 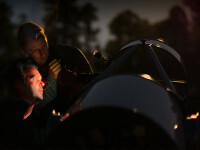 I had a few telescopes at home and I was sometimes going with friends and family to dark areas with a telescope to show them a galaxy, a nebula or a star cluster. I realized they really enjoy it a lot and I thought this could be an activity to be offered to tourists. The big advantage is this is an activity that does not require any particular physical condition. Children, disabled and elders can do it as well. How long have you been running Astro GC? I started 5 years ago. See the full article on Radisson Blu site here: Radisson Blu article.